Respect is earned. This is true even when it comes to our relationship with ourselves: We have to earn our own self-respect by acting with integrity and being true to our word. Then we need to maintain this self-respect through right relating. Respect is part of right relating but we need to consider our levels of compassion, responsibility and ability to relate deeply as well in order to be able to maintain respect within the relationship. A person who is not met with compassion will not feel respected. Showing compassion in a relationship means that we have the best interest of the other person at heart. However, always putting the needs of others is not a sign of compassion – it is a sign of imbalance. Being responsible in the relationship means that we act on our compassion by listening actively and responding in a helpful manner so that we promote maximum growth in our partner. When we act at cross purposes with the life purpose of our partner, we disrespect both them and ourselves. And if we feel we must act this way, it is a sure sign of incompatibility. Our ability to keep our hearts open is what truly defines the relationship. A person who doesn’t feel seen through eyes of the heart of their partner will not feel respected. Keeping the heart open takes courage because it means we sometimes have to show our vulnerability. It’s easy to be reactive and shut down when we feel hurt. 1. What do I need to work on in terms of self-respect? 2. How can I increase my compassion levels? 3. How can I encourage growth in my partner? 4. How can I make sure that I don’t shut my heart down? 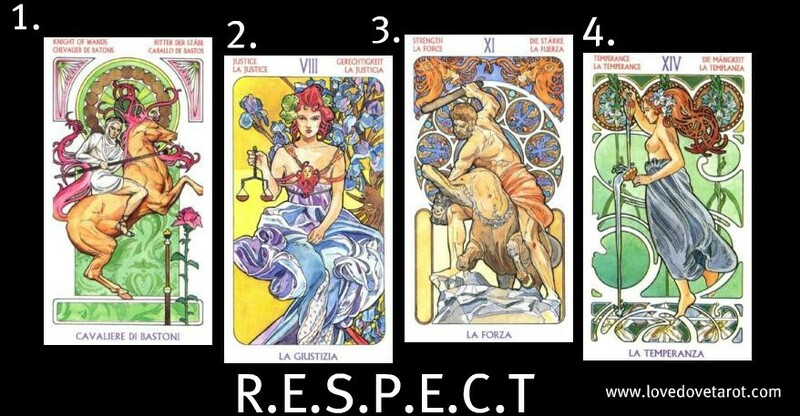 The Art Noveau Tarot © Lo Scarabeo. All rights reserved. Justice (Libra) is one of the main Heart Chakra Tarot cards and shows me that I need to be watchful and check in on what is going on at the heart level throughout the day. I can use some of the heart chakra crystals to remind me. Aventurine and rose quartz are ideal. I can also call on Archangel Anael for help with self-love and Archangel Raguel to maintain balance and harmony. Strength (Leo) tells me that I can encurage my partner by showing him how proud I am of him. Kindness is key. Our passionate connection is a source of strength to both of us. Also: Play more together! Temperance (Sagittarius) reminds me that I will need to continue to work on my own heart healing and soul alchemy to keep the relationship healthy. A tendency to be reactive and speak before I think needs to be curbed so that my words can be aligned with what is truly in my heart. This is a card of optimism, so I need to stay optimistic about both myself and the relationship. It is interesting to note that all the cards I pulled here represent the two Elements (Air and Fire) that I am low on in my natal chart. What we lack, we often project or seek to compensate for through others.